10 gallons of wort split into 3-gallon carboys. Each beer was pitched at a different rate. Just one of the endless possibilities for split batch brewing. What’s better than enjoying a nice brewday and ending up with a carboy of fermenting beer? How about enjoying a nice brewday and ending up with two or more carboys of fermenting beer? There are many ways you can split a batch and increase the diversity of your brewing output. Last week, I posted a story about the logistics of entering homebrew competitions. I interviewed Mark Schoppe for the story and splitting batches of beer was his main method for generating multiple entries to enter in contests. Whether or not you brew for contests, the lure of getting 2 for 1 is sometimes hard to ignore. Here are some ideas — from Mark and from other sources, including my own experience — for split-batched beer combinations. All-grain brewers with multiple kettles can split their pre-boil wort (sweet wort) into two or more kettles and boil them independently. The classic example is the English parti-gyle system where the first, high-gravity runnings are boiled to make a strong ale and later, lower-gravity runnings are used to brew a lower-gravity beer or beers. However, it’s also possible to split the wort evenly and proceed from there. Many beers have a dark twin. And, it’s easy to brew these pairs by splitting the boil and steeping additional dark grains in one of the worts. For example, you could split a Pilsner wort and steep some debittered black malt in the second wort to make a schwarzbier. Or, you could split a wheat beer wort and make a dunkelweizen by steeping some chocolate malt and/or dark Carafa malt in the second kettle. (Or better yet, a partial mash of Munich malt and dark Munich malt could add the dunkel to the weizen.) An English bitter and a dark mild are another possibility. Splitting the wort before the boil also requires that you either have two wort chillers, or you boil one wort longer than other and chill the first while the second is still boiling. Alternately, you could begin one boil and hold off the second for awhile. The most common way to split a batch is to run the same chilled, post-boil wort into two or more fermenters. 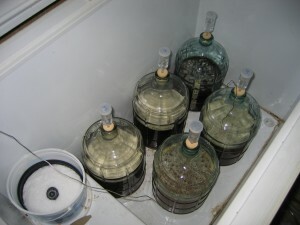 And, the most common reason for this is to ferment the beer with two different yeast strains. Many times, two of the same style of yeast strain are used, to detect any small differences. However, you can make two dissimilar beers by pitching very different yeasts. For example, you could boil an IPA wort and ferment an American IPA and a Belgian IPA. You could also make a lager and an ale from the same wort. For example, an American Pilsner wort fermented with an ale strain would be a cream ale. Or, you could brew a lager and an ale version of the same porter. You could also pitch “regular” yeast to one fermenter and sour the wort in the other with bacteria. You could, for example, ferment a lightly hopped wheat beer in one carboy and a lambic-like sour beer in a bucket. Splitting a batch in the secondary fermenter gives you the chance to flavor, spice or age the beers differently. A wheat beer could, for example, be racked to a carboy for aging, with some of the wort diverted to a bucket to age on raspberries. An old ale could be aged as normal, but a small carboy or gallon jug could be split off to make a spiced holiday ale. If you have access to barrels, you can make regular and barrel-aged versions of the same beer. In many cases, splitting the wort into two carboys and adding oak cubes to one produces a similar result. You could, for example, brew an imperial stout and age some of it on bourbon-soaked oak cubes. One other possibility is to ferment the same at different temperatures. If you found a German wheat beer strain you liked, you might try fermenting at different temperatures to get the right balance of clove and banana for you. You can even do small split-offs at bottling. You could take small chili peppers and put them in a few bottles of your brown ale for a spicy “mole” beer. You could also prime a your bottles with varying amounts of sugar for varying levels of fizz. When splitting batches, keep in mind that you don’t need to split the volume 50:50 — if you expect to drink less of the second version of a beer, split off only a gallon or so. Also, when splitting batches, make sure that beers “make sense.” It would be better to brew 5 gallons (19 L) of one great beer than end up with two 2.5-gallon (9.5-L) batches of mediocre beer. Here are just some of the possibilities to consider when considering making two beers from the same wort or beer. I’ve used the partigyle method to make a double IPA and a red ale. Its easy to adjust a wort with some steeped grains on top of the ‘big beer’ and ‘small beer’ split. Yes, it’s very simple. You only need about 15 minutes of steeping time to get the color and flavor out of the specialty grains. I just had a Mild by Barley Brown (Baker City Brewing Co) that is a second running of their Russian Imperial Stout. The Mild is Fantastic! The Mild is called Don Vanuchi’s Little Buddy- and their RIS is Don Vanuchi. I may give a RIS/Mild brew day a shot. That sounds like a good idea. I’ve had some very good second running beers in the past couple years.